U.S. Olympic gold medalist Ryan Lochte apologized Friday for “not being more careful and candid” when describing an alleged armed robbery in Rio last week. The apology appeared on the American swimmer’s official social media accounts, a day after Brazilian police accused Lochte and three of his teammates of fabricating details of their claim that they were robbed at gunpoint on Aug. 14 by men impersonating officers. Initially, Lochte told NBC that an assailant pushed a gun to his forehead, demanding he give up his possessions. But Lochte’s early account conflicted with Rio police who said the swimmers had a “rowdy gas station confrontation” with security guards. Police said Lochte and the others had vandalized a gas station bathroom while intoxicated. 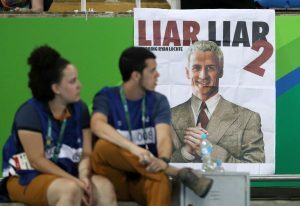 Despite rebutting the swimmers’ accounts, Rio police did acknowledge that a security guard had pulled a gun on the athletes at the gas station and demanded payment for the damage, the Associated Press reported. Civil Police Chief Fernando Veloso told AP that the athletes paid 100 Brazilian reals, or about $33, and $20 in U.S. money to leave the gas station that night. Later on, Jimmy Feigen also agreed to pay nearly $11,000 to a Brazilian charity as part of a settlement with a Rio judge. “They were not victims of the crimes they claimed,” Veloso said Thursday at a news conference.